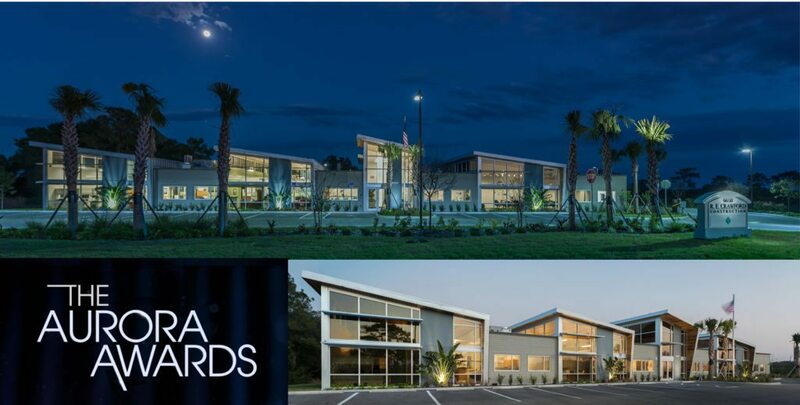 R. E. Crawford Construction’s new headquarters in Lakewood Ranch has earned a Grand Aurora Award, presented annually by the Southeast Building Conference and Florida Home Builders Association. Built by R.E. Crawford Construction and designed by WBRC Architects Engineers, the facility was chosen as this year’s Best Commercial Project under 20,000 SF. The new 10,800 SF, $1.7 million company headquarters is a collaborative workspace with nature views from virtually every workstation. Located on a 1.5-acre site on Professional Parkway, the building includes space for two tenants, and is highly visible from I-75. The modern design, led by WBRC architect Doug Whitney, includes an asymmetrical series of glass and aluminum storefronts with pent roofs. The pitch of the roofs provides space for north-facing clerestory windows, adding indirect daylight without the glare and heat gain of traditional skylights. Innovative materials include a handcrafted central workstation, louvered cedar boards for acoustic dampening, and a custom-made light tower created from thousands of colored marbles. R.E. Crawford Construction, owned by Jeff and Utahna Smith, was founded in 2005 and has expanded its reach to 40 states. WBRC Architects Engineers, founded in 1902, has current projects in Florida, Georgia, Texas, Louisiana as well as throughout Maine and New England. The 36th annual Aurora Awards are presented by the Southeast Building Conference and the Florida Home Builders Association. Design and construction professionals from 12 states and the Eastern Caribbean are eligible to enter; this year’s competition garnered over 400 entries. Read full profile of this project.